Scout Handmade + Vintage Market + Giveaway Winner! 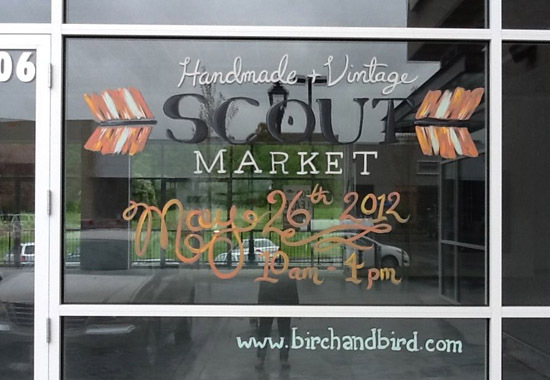 The weekend is almost here and with it comes the Scout Handmade + Vintage Market a local pop-up market of sorts (here in the lower mainland) brought to you by Rachel and Lily of Birch + Bird. The market runs May 25th-26th, 2012 at The Parallel Marketplace (across from Thrifty Foods) 1920 North Parallel Road in Abbotsford BC. Friday, May 25th from 6-9pm will be open to ticket holders and invited guests only (sold out). Saturday, May 26th will be open to the public from 10am-4pm for a small admission fee. Partial proceeds of the admission will go to a local charity, Life Recovery, a non-profit residential women's recovery program. Also - we have a winner chosen for the Friday night 1st dibs night giveaway we held here all week. Lily just did a random number generator and it came in at #32 which is a Judy Klassen. Judy if you could contact us via email so we can make arrangements for you to pick up your tickets! Yay!